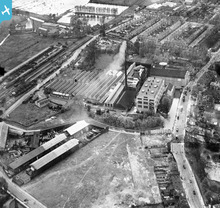 This image shows the location of the Lady Chapel of Merton Priory church (1117-1538) and the Chapter House, beneath the railway lines. Nestled amongst the Board Mills are the works of Morris & Co. (1881-1940). 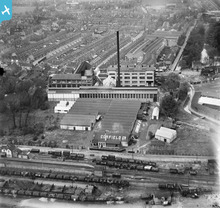 The 18th-century apprentice boys house, the dye and stained glass workshop and the new tapestry repair shed, built in the 1920s can be seen. 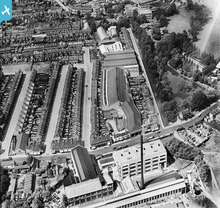 This image, looking west along Merton High Street, shows William Morris’ workshops and Liberty & Co. workshops at Merton.